Within a year of the establishment of the Zoological Society, arrangements were completed for the publication of Pakistan Journal of Zoology. The first issue of the Journal was published in June, 1969. Since then it was published regularly, twice a year. In 1985 the biennial Journal was upgraded to quarterly publication. 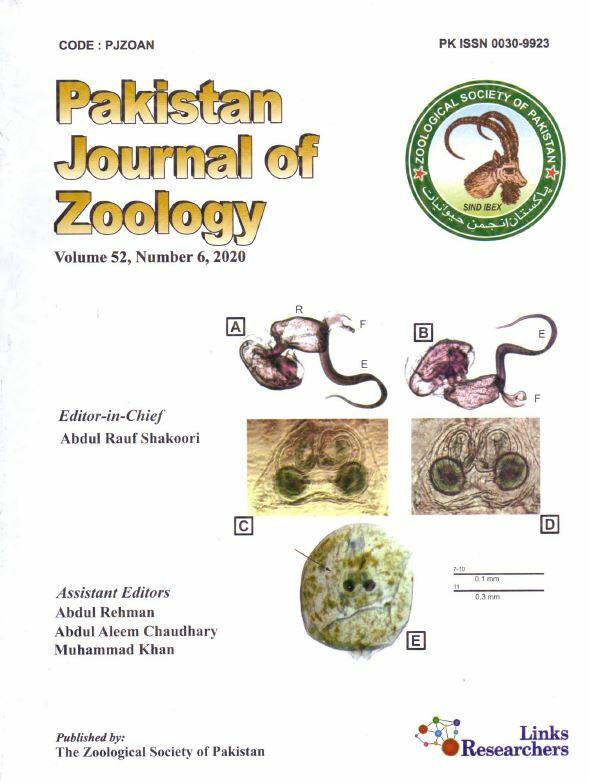 Ever since its first issue Pakistan Journal of Zoology has been published uninterrupted for the last 35 years. The number 1 of volume 36 of year 2004 is due to appear in March 2004. The Journal has a wide circulation in- and outside Pakistan. It is abstracted/listed by all the leading Abstracting Services of the world, like Biological Abstracts, Chemical Abstracts, Current Contents, Zoological Records, Information Retrieval Limited, London, Services Centrale de Documentation de l’ORSTOM, Paris, Cambridge Scientific Abstracts, Institute of Scientific Information, Moscow, etc. On subscription or in exchange, the Journal is sent to 125 institutions in 110 countries which include Argentina, Australia, Bangladesh, Bulgaria, Brazil, Canada, Chile, China, Columbia, Cuba, Denmark, East Germany, Egypt, Finland, France, Holland, Hungary, India, Iraq, Italy, Japan, Kazakhsean, Kenya, Libya, Nepal, Netherlands, New Zealand, Nigeria, Paris, Philippines, Poland, Portugal, South Africa, Spain, Sri Lanka, Sweden, Switzerland, Turkey, Turkmanistan, U.K., U.S.A. and Russia. In exchange, the Society receives 91 journals and periodicals. The articles submitted for publication in Pakistan Journal of Zoology are peer reviewed by international experts. Important Notice Regarding Online Submission of Research articles in PJZ.